ISO 4165 is a standard adopted by the International Organization for Standardization (ISO). It describes a double-pole DC connector to supply between 12 and 24 V DC at up to 12 amps to appliances in vehicles. It is similar in design to a cigar lighter receptacle, but is shorter and smaller in diameter. It was originally a standard fitting on all the German military vehicles during World War II. 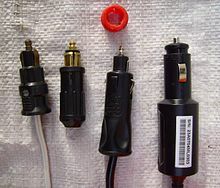 At least one manufacturer sells a combination plug that combines a cigar lighter plug and a Powerlet plug. ↑ "ISO 4165:2001 Road vehicles -- Electrical connections -- Double-pole connection". International Organization for Standardization. 2012-04-20. This page was last changed on 10 August 2018, at 20:53.